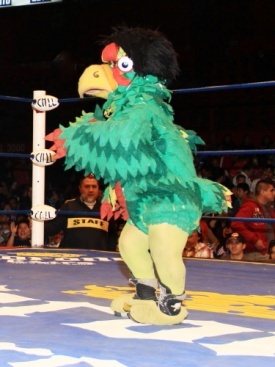 Micro luchador who's best known as Zacarias el Perico, the tiny bird who interferes in matches and gives tecnicos 619s. In 2014, Zacarias was used to add more members to the Peste Negra group. He explained to Mr. Niebla that he had found his own mascots outside of Arena Mexico, and introduced Niebla to Barbaro Cavernario and Herodes Jr. as new members. In 2017, CMLL brought back micro matches. Zacarias and Mije were the lead rudos against Micro Man and El Gallito. Zacarias debuted a new mask design in the future match, apparently helping his visibility and maneuverability. Zacarias is thought to have performed as other characters in CMLL, but it's not clear. He was believed to be Mini Maximo at one point, though there's another Mini Maximo who also ended up using the gimmick. CMLL at one point aired a vignette with both of Zacarias & Mini Maximo, which could be seen as disprove or winking at the same person working twice on some shows. It's possible he was also a Ultimonito, the mascot of Guerreros del Atlantida and the rudo rival of Monito or Atomo, a short lived minis character - but those also could have been the other Mini Maximo. GdA: Atlantis * Sangre Azteca * Olimpico * Eclipse * Rey Escorpión * Dragon Rojo Jr.
Former: Heavy Metal * Rey Bucanero * Herodes Jr. This page was last edited on 25 January 2018, at 11:42.